In a covered medium saucepan, cook green beans in a small amount of boiling salted water for 8 to 10 minutes or until crisp-tender. Drain; submerge beans in enough ice water to cover and let stand until cool. Drain again; set aside. Meanwhile, in a very large skillet, heat olive oil over medium heat. In a large bowl, toss chicken with oregano. Add chicken to hot oil in skillet; cook for 5 to 6 minutes or until no longer pink, stirring frequently. Remove chicken from skillet and set aside. Add squash to skillet; cook and stir over medium-high heat for 3 minutes. Stir in chicken, green beans, cannellini beans, chicken broth, and garlic. Bring to boiling. Add tomatoes, basil, salt, and pepper. Cook about 1 minute or until heated through. 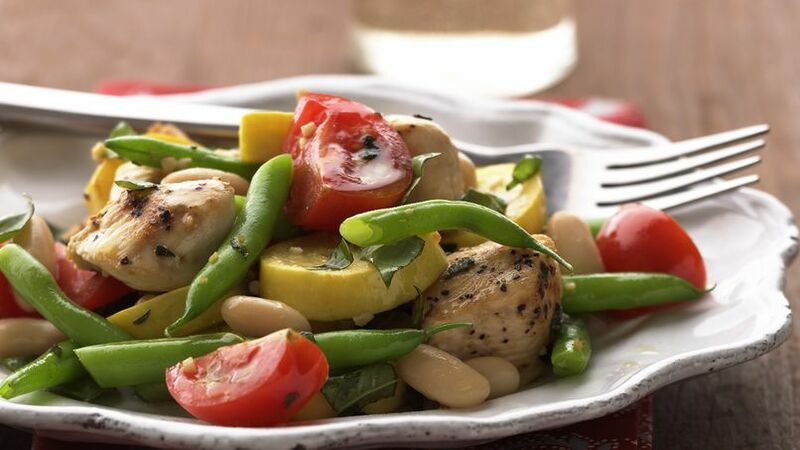 This light and luscious entrée is packed with fresh ingredients—it’s a perfect dish to make after a trip to the farmer’s market.